This kitchen, walk-in pantry and bathroom were recently designed and installed in Armadale by the Rosemount Kitchens team. Designer Ben Schultz worked with the clients on a kitchen project that resulted in a beautiful yet highly practical kitchen space. Using the latest finishes and colours and state-of-the-art accessories such as LeMans II by Kessebohmer, a 450mm wide cargo bin and Billi hot/cold tap, the new kitchen is now the envy of their family and friends. The Clients did not want to change the floor tiling, so Ben was able to work with the current footprint needed to make only minor changes to the kitchen layout. 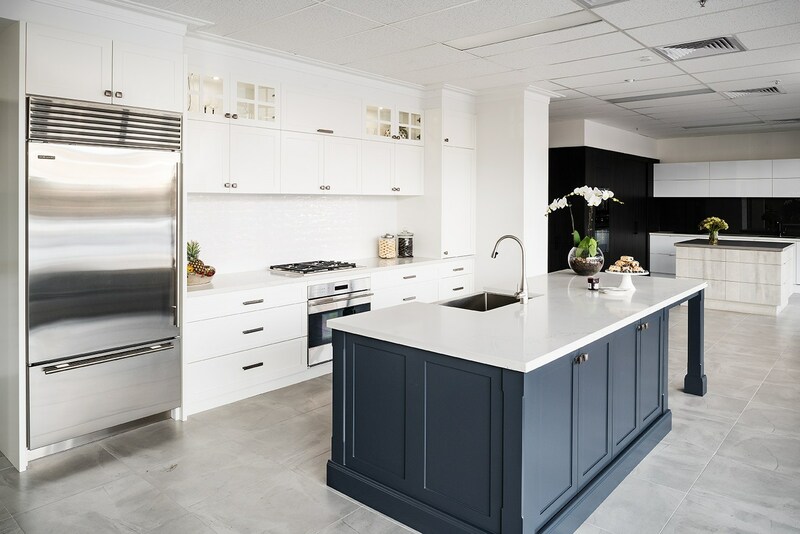 High Gloss and Handle-less cabinetry together with stone benchtops and stainless steel appliances were used to create a stunning contemporary style. There was an existing walk-in pantry (butlers pantry) that needed some design tweaking to make it practical. Open shelving was chosen for easy access to everyday items. Although the space was small, appliances such as toaster, kettle mix master, blender and toasted sandwich press can be left on the bench – which means they are always ready for use. The clients wanted a bathroom vanity that looked modern, but also had plenty of storage. Ben achieved this outcome by using high gloss cabinetry and stone benchtops with a modern top-mount sink and wall mounted tap. Installing the bathroom vanity with deep set back kickboard gives the modern look of a floating cabinet (wall hung) without the cost and work sometimes involved in installing wall hung cabinets. The kickboard gives the cabinet the stability and strength it needs to be safely installed. Wall hung cabinets need extra supports in the wall for safe installation. In some older homes with solid walls there can be restrictions. Hardware: Blum Tandembox drawers with Tip-on, 450mm wide Cargo Bin, LeMans II corner unit, Billi hot & cold tap. Need help with your kitchen project? Contact us or visit one of our showrooms.